Judith Maria born on 11 Nov 1953 in Barrio Obero, Santurce,P.R. 1st husband Alberto D. Pena - Divorced. Parents: Jose M. Oxholm Lopez (Poeta) Born: Guayanilla, Puerto Rico. [May 8,1927- 9/28/04 Passed Away: Heart Attack Detroit, Wayne County. Funeral Home: Charles R. Step. Cemetery:18425 Beech-Daly Rd. In state Thursday 9:30 a.m. and Mass 10 a.m. at St. Agatha Catholic Church (Beech-Daly Rd N. of Grand River Ave.). Interment Glen Eden Cemetery.MI.] Married: [April 18, 1953] in Judith VILLAFANE Collazo in Rio Piedras, Puerto Rico. Other Sisters and Brother: Maria Luisa, Maria Teresa, Nilda Maria and Jose. 2nd marriage:Their mother:Maria Alicia Uribe Mendez [Oxholm]. (same father - [Jose M. Oxholm Lopez]. 1st. Marriage: Judith Villafane Collazo Born: 27 April 1922 in Caguas - December 14,1960 Passed Away: [Colon Cancer]. John (Delbert) COPE Villafane was born on 7 July 1946 in Rio Piedras, Puerto Rico. He married Nancy Ramirez was born on 16 Apr 1947 in Caguas, Puerto Rico. Living in P.R. then relocating to Florida with their family. [Three children]. 2. Duvan COPE Ramirez was born on 10 September 1980 in Puerto Rico 3. Darcy COPE Ramirez was born on 5 August 1983 in Rio Piedras, Puerto Rico. Sister:(Same Mother and Father) Nellie Ann Oxholm Villafane [Drake] - Born: Detroit, Michigan [03/16/55 -] Registered Nurse - ICU. Nellie's husband: Leonard DRAKE from Detroit, Michigan. Nellie's daughter Lena Judith Drake. Born on 08 April 1989 in Livonia, Michigan. She was my parents 1st grandchild. Up to 11 grand children now 2005. (Lena is following in her grandfather's foot steps (poet). Lena's grandmother [Mrs. Gertrude Drake] of Michigan - passed away after a long illness (cancer) the first week of July 2001. She was a very nice women. I really liked her alot. My mother's father:*** Pedro VILLAFANE Cuevas; My Grandfather was born on 13 July 1890 in Rio Piedras, Puerto Rico. He died in 1974 in Caguas, P.R. and was buried in Las Piedras, P.R. Married: Maria COLLAZO Colon in Puerto Rico and she was approximately age 13-16 in Puerto Rico. She was a such a wonderful person with a very kind heart. Jose COLLAZO JIMENEZ Las Piedras)(photo available on index page) was born in Puerto Rico on December 24, 1872 and died January 24, 1927 in Junco, P.R. of pneumonia at the age of 55. Jose married "Gregoria COLON Machin" (18 years old) and she passed on at the age 34 during birth of twins/she had 6 children. 2nd wife: He then married "Maria Rios" from San Juan. They were divorced. Had no children. His 3rd and last wife was "Ramona Reyes Lopez" Ramona died in 1932 due to T.B. at age 44 in Rio Piedras. There were many children. For More detailed material refer to the PAF. 2. Ivonne VILLAFANE Candelas was born in Puerto Rico. She is a Medical Dr. They have been married 30 years this passed July. They have one Grandchild. 1. Enrique Cuebas Candelas was born in Puerto Rico. Emil Cuebas Candelas was born in Puerto Rico. Married and they have one child. Jose (papo) E. Cuebas . *** Juan VILLAFANE Rotger was born/died in Puerto Rico. Juan married "Rosa Rotger". Rosa Rotger was born/died in Puerto Rico. Juan E. VILLAFANE Rotger was born in 1861 in Puerto Rico/and died on 21 Feb 1941 in Caguas,P.R. Juan E. Villafane Rotger married:"Martina Rosario Cuevas [Caldas]". Martina was born on 30 Jan 1867 in Puerto Rico/and died on 6 Sep 1932 in P.R. Martina was married to Juan E. VILLAFANE Rotger. 1. "Paula Villafane Caldas " was born: in P.R. 3. "Rosita Buxo Caldas ". Santiago Rotger was born: early 1800 in Puerto Rico/died in Puerto Rico. Santiago married Rita (m) ROTGER Caldas (mother has same name as daughter). Rita (m) ROTGER Caldas was born early 1800 in Puerto Rico/died in P.R. Rita (daughter) Rotger Caldas was born on 6 Feb 1848 and died in 1924 in P.R.. Married Nicolas Cuevas Berrios on 23 Apr 1863 in P.R. 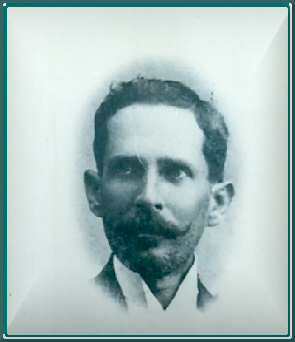 NICOLAS CUEVAS BERRIOS Born 10 May 1842 in P.R./died in 1902 in P.R. She married Juan E. Villafane Rotger. "Martina ROSARIO Cuevas Caldas died 06 September 1932 in P.R. 2. "Rosario Villafane Cuevas" Born: P.R. 12 December 1887 and died 1-1-1952 P.R. Daughter: "Rita M. Villafane Cuevas" P.R. Born/died at birth. 3. "Juan Gustavo Villafane Cuevas" P.R.Born:10 March 1893 and died in 1979 P.R. 4. "Manuel Armando Villafane Cuevas" P.R. Born:17 June 1896 and died 1963 P.R. 5. "Elena Villafane Cuevas" P.R. Born: 18 August 1900 ELENA Villafane Cuevas married in San Lorenzo in 1931. She died 1976.P.R. 6. "Raquel Benito Villafane Cuevas" P.R. Born: 5 January 1912 and died 1982.P.R. 7. "Amparo Villafane Cuevas" Born: P.R. 12-7-1904 and died 10-40-1940 P.R. (apellido Mendez) He was born in Puerto Rico/died in P.R. Married Paula Villafane Cuevas. Paula Villafane Cuevas was born in Puerto Rico/and died in P.R. Paula married (apellido Mendez). Paula se caso, apellido Mendez). 1.Carmen Mendez Cuevas, 2.Provi Mendez Cuevas, 3.Delfin Mendez Cuevas. Juan Gustavo VILLAFANE Cuevas was born on 10 March 1893 in Puerto Rico. He died in the year 1979. Juan married Mariana Penzol. Mariana VILLAFANE Penzol was born on 16 Apr 1895 in Puerto Rico/died in January 1986 in P.R. Eliseo Mangual was born in Puerto Rico/died in P.R. Eliseo married Hilda E. Villafane Penzol. Hilda E. Mangual Penzol was born in Puerto Rico. Fred (Francis) Reichard was born in Puerto Rico. He married Rita M. VILLAFANE Penzol. Jose Noya was born in P.R. He married Hilda Mangual Penzol. "Hilda Mangual Penzol" was born in Puerto Rico. JOSE NOYA "Hilda Noya Penzol"
Rafael Criado was born in Puerto Rico. Rita (daughter) Mangual Penzol was born in Puerto Rico. Rita married Rafael Criado. 1.Sergio Criado Mangual was born in Puerto Rico. Manuel Armando VILLAFANE Cuevas was born on 17 May 1896 in Puerto Rico. He died in 1963 in P.R. Manuel married Isabel Villafane Aponte. Isabel Villafane Aponte in Puerto Rico. 1. Evelia VILLAFANE Aponte was born in Puerto Rico. Joaquin Rodriguez was born in San Lorenzo, Puerto Rico. He married Elena VILLAFANE Cuevas in San Lorenzo, Puerto Rico. Elena VILLAFANE Cuevas was born on 18 Aug 1900 in San Lorenzo, Puerto Rico/died in 1976 in San Lorenzo. Elena married Joaquin Rodriguez in San Lorenzo. Liduvina Rodriguez Cuevas was born in San Lorenzo, Puerto Rico. Leonardo J. Rodriguez Cuevas was born in San Lorenzo, Puerto Rico. He married Hilda Jimenez in San Lorenzo in the year 1961. Hilda Jimenez was born in San Lorenzo,Puerto Rico. 1. Hilda E. Rodriguez Jimenez (d) was born in Puerto Rico. 2. Leonardo Rodriguez Jimenez was born in San Lorenzo, Puerto Rico. Mariano Ferreras was born in 1895 in Puerto Rico. He married Amparo VILLAFANE Cuevas. Amparo VILLAFANE Cuevas was born on 9 Feb 1904 in Puerto Rico. She died on 4 Oct 1940 in P.R. 1. Wigberto Ferreras Villafane was born on 2 Nov 1929 in Puerto Rico. 2.Myrna Ferreras Villafane was born about 1930 in Puerto Rico. More work is needed on this project. Still on-going. Not final.